The Neoclassical movement is an American phenomenon that began with the 1893 Colombian Exposition in Chicago. Greek Revival precedents were most commonly used, but with more variety in composition and detail. 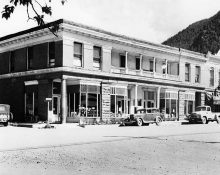 In Aspen, popular neoclassical details were simple Doric columns, triangular pediments and large cornices with rows of dentil moldings. Other classical orders, including Corinthian and Ionic, sometimes are used as well. These appeared on both residential and commercial buildings.